England’s chief medical officer Prof Dame Sally Davies has warned of a “post-antibiotic apocalypse” that could potentially spell the end of modern medicine. It is no secret that antimicrobial resistance (AMR) has escalated considerably in recent years. It is now responsible for high numbers of deaths the world over. However, AMR is not receiving the attention that it warrants, given that it could render modern medicine entirely ineffective if left unchecked. Antibiotics are a staple of modern medicine. Not simply involved in curing an infection they are also used in preventing them. It is in this capacity that they have elevated us above times when a small wound or minor surgery could cause death through infection. “We really are facing – if we don’t take action now – a dreadful post-antibiotic apocalypse.” claims Davies. The number of procedures reliant on antibiotics shows the extent of their impact. Surgeries, at any level of severity, would leave the patient highly prone to infection without antibiotics. Life expectancies would sharply fall as the elderly become far more prone to infectious disease. The quality of life for elderly people would also fall, as operations such as hip and knee replacements would then hold the very real possibility of a death via resultant infection. Caesarian sections could become far more dangerous. Currently, despite the use of antibiotics, infection remains a possibility. The surgery is intrusive, and so will always carry a degree of risk. However, should antibiotics prove to be ineffective, this risk would be considerably higher. This would cause a spike in the rate of maternal and infant mortality. Despite the risks posed to nearly every aspect of the healthcare system, AMR does not yet appear to be viewed by the public as the threat that it may well represent. The threat posed by AMR will have implications the world over, and it may be occurring far more rapidly than was previously expected. A recent meeting of the American Society for Microbiology uncovered that a gene called mcr-1, which confers resistance to the antibiotic Colistin, has increased in prevalence at a considerable rate. 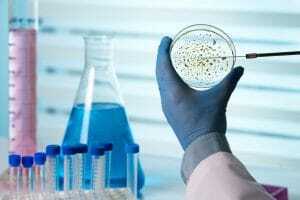 The gene was first uncovered only 18 months prior to the meeting, yet it was found that in one area of China, around 25 percent of patients harboured infections possessing the gene. Colistin is a last resort antibiotic, typically used when other treatments have failed. For this antibiotic to be rendered ineffective in 25 percent of patients in an area over an 18 month period is concerning. This may indicate that genes such as mcr-1 that confer resistance to an antibiotic are far more numerous than we are currently aware, and gaining prevalence at alarming rates. As in the case with the mcr-1 hotspot in China, there are other locations that provide optimal conditions for the development of AMR. Some of these appear to be localised to hospitals, often ones in highly populated urban areas where the spread of disease is rapid. Others occur independently of human consumption of antibiotics, instead being caused by the misuse of huge amounts of antibiotics in livestock. Overuse of antibiotics in livestock is epitomised by India, in which antibiotics are often commonly mixed into animal feeds. The antibiotics are used to promote growth, for example in poultry farms. However, such widespread use of antibiotics in commercial scale livestock farms provides an ideal breeding ground for bacteria to become immune to the antibiotics in use. A study conducted on poultry farms in Punjab state found chickens often carried Escherichia coli strains that are resistant to commonly prescribed antibiotics such as broad-spectrum fluoroquinolones. Though the study was limited to Punjab, the implications of its finding apply both to other Indian states as well as any instance of widespread antibiotic use on farms globally. The World Health Organization lists antibiotic use as a growth supplement as a practice that needs to be eliminated. Instead, it recommends the use of vaccinations in animals to prevent infections, as well as improved welfare and hygiene to reduce the spread of infection. Drug manufacturing plants in India must also be thoroughly inspected. Davies notes a case in which “Effluent from one treatment plant had concentrations of antibiotics higher than levels we try to achieve in the bloodstream of patients”. This creates bodies of contaminated water and soil in which microorganisms grow bathed in antibiotics. Within these bodies, any organism that holds a mutation that confers it resistance to the antibiotic can grow without competition. Davies summarises the situation as a killer “without a face”. To many, the difference between a family member dying from tuberculosis, or an AMR strain of tuberculosis is not a priority, either results in a death of a loved one. Therefore on an individual level, many people are unconcerned. Overuse of antibiotics is seen as a major contributor to the rise in AMR. While individuals still request antibiotics for problems that would not benefit from them, such as a cold, this remains an issue. In the UK, there has been a nationwide attempt to reduce the amount of antibiotics prescribed by GPs. Of the antibiotics prescribed, Davies estimates around one in three, to one in four were not needed. This clamp down on prescription medication has so far seen modest results. Over the 2014 to 2015 period, there was a reduction in antibiotic use of 4.3 percent compared to the previous year. However, reducing the use of antibiotics in a single nation will have little effect if the endeavour is isolated to that nation. For results to be achieved, and the rate of resistance to be curbed, a global effort must be made. Policies are currently enforced in numerous nations within the EU to curb the rate of antibiotic use in farm animals. 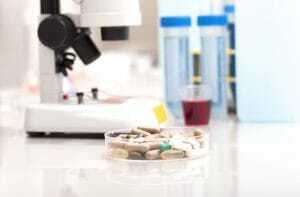 Under the Obama administration the US also implemented policies bringing attention to the rising threat of antibiotic resistance, this notably followed accusations of years of inaction from the FDA. 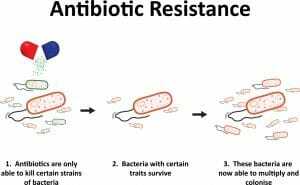 Despite our best efforts to reduce the spread of AMR, it is a naturally occurring biological process.. Genomes mutate over time, this process occurs more quickly in rapidly reproducing bacteria and viruses. While the mutations are random, those mutations that give an advantage in the bacteria or viruses current environment allow for them to survive — and replicate — more successfully than those without the mutation. Therefore, it is not a case of “if” our antibiotics cease to work, but “when”. The process can be delayed by reducing the factors that contribute to it such as the overuse of antibiotics both in people and in livestock. It is however something that must be prepared for. We are already seeing the effects of AMR. As previously noted on Hyderus, drug resistant HIV is becoming more common, as are drug resistant strains of malaria. Another severe example is tuberculosis, some strains of which are resistant to multiple different types of antibiotics and are rapidly approaching a point where they are all but untreatable. At present it is estimated that around 700,000 people die each year as a result of drug resistant strains of various diseases. This figure is projected to reach 10 million per year by 2050 if no action is taken to reduce the spread of drug resistance. More must be done to combat the spread of antibiotic resistance. However, healthcare systems and pharmaceutical companies must prepare for a situation in which currently used antibiotics are rendered ineffective. Innovation and research must be prioritised in order to create new treatments.